" I was totally impressed with the selection and the prices." This dramatic expose will change your opinion of Halloween forever. 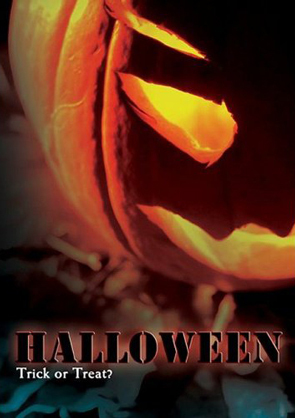 This highly informative DVD traces the pagan origins and history of Halloween. The Pagan/Occult calendar of Druids, Witches, Pagans and Satanists marks Halloween as one of their highest "holy days". This DVD uncovers the mystic Druidic rites and ceremonies with which "Samhain" (Halloween) was originally observed 4000 years ago. The occult rituals seen in this DVD are real and not re-enactments. Parental Guidance is strongly advised. All the seemingly innocent symbolism of Halloween - black cats, snakes, broomsticks, bonfires, "trick-or-treat", jack-o-lanterns, apple dunking and costumes - has its roots in Sorcery, Witchcraft and Satanism. Parents' responsibilities are challenged to decide whether to allow their children to participate in celebrations which glorify Pagan Occultism. The Spanish version of this DVD is no longer in print. This newly formatted DVD now has BOTH the English and the Spanish Language tracks on the same disc! An exhilarating, heart-warming story that'll leave you riding tall in the saddle! Gigi, God’s Little Princess is learning that a real princess treats others with kindness and love. Hold on to your beards! Latest Reviews for Halloween: Trick Or Treat? Awesome DVD: exposes the dark scary truths about Halloween, with interview with Hal Lindsay, FORMER satanist William(Bill) Shnoebelen (With One Accord Ministries-has Halloween teaching DVD), police officers, FORMER witches, satanist, other Former occult leaders, horror film info/facts,etc. Info on how we should pray for the night. This is a wake-up call for the Christian church & Christians. We will be showing at our church (not for young children)(Also recommend(former witch=A+) Carol Kornacki Ministries in Charlotte, NC). This is doc. DVD is not scary, BUT it is disturbing (information/truths)! !Well done! PRAY for YOUR CHURCH; PRAY for THE CHILDREN;PRAY for SCHOOLS; PRAY for THE ANIMALS; PRAY for THE TERRITORY/REGION:PRAY for the SATANIST,WITCHES,etc ,FILM MAKERS....In the name of JESUS !! Also, Demonbuster.com has printable info =scroll down and CLICK on HALLOWEEN to get to information and scriptures about Halloween. The devil is a LIAR!!! This was informative, but way too graphic for my taste. I don't rent horror for a reason, my 15 yr old daughter chose herself to go to her room while I watched/fast forwarded through most of the film. I understand what they were trying to do but it just seemed yick, only wanted to let others know to be cautious if they watch, though the information was very useful, I would like to see one w/o the actual scenes etc. Thanks! I want to say AMEN! to all the people that LOVE and HONOR our Lord and Saviour Jesus Christ for their stand against Holloween...Lisa K. Cheyne B..nice verse. Dianna B. Janet B...my sons are 12 and 13 they love the Lord and has never went trick or treating. and Janice S. Many are CALL but few are choosen. And God knows who are His own. keep strong in the Faith until he returns. AMEN. This is an informative movie as most don't know the background or the darkness behind Halloween. I am saddened by so many Christians that involve themselves with this holiday. The argument that we celebrate other pagan holidays doesn't hold water. Do we dress up like demons for Christmas or Easter? Halloween is holiday for the worldly people that don't have a relationship with Jesus. This movie points out why the holiday is evil, no matter how friendly you attempt to make it. The movie wasn't made to inform the world of Halloween, but to inform Christians. I believe it has accomplished that goal. This movie is not for children, but for parents/adults. Why are so many scoffers so quick to call "Believers" judgmental? If we true followers of Jesus Christ did not speak truth, ALL WOULD BE LOST. Whenever a believer speaks any of GODS truth in his word you like to call it being "JUDGMENTAL". Maybe you need to get into the WORD yourself and learn some truth because we that belong to GOD, the one and only TRUE GOD of the holy Bible.... We speak truth because WE are his eyes, his ears, his mouth until the day HE returns and if WE don't speak truth, WHO WILL? Halloween along with ALL The other pagan holidays are from the occult and no TRUE BELIEVER should be partaking in ANY Of them. GET out of the phony religions you were raised in and PICK UP YOUR CROSS and follow Jesus.! Amen Bryan S. I would like to think that I a Christian, I thought we were suppose to respect any and all religions even if we do not agree with what they do. Maybe I am wrong in how I was taught. What Bryan S. said is very, very true!! !